Accident pain? Let us help. There are many types of muscle pain. 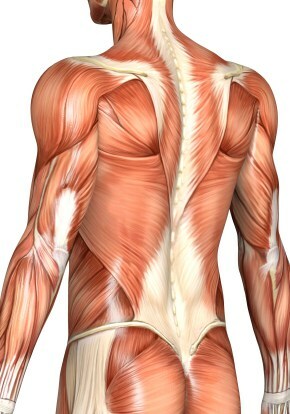 Sometimes muscular pain is the direct result of injury to the muscle, as in the case of a muscle pull, tear, or rupture. Other times, the muscular attachment to the bone (“tendon”) becomes strained in a specific injury or from repetitive strain. Examples of repetitive strain to the muscle or tendon include prolonged and/or poor sitting postures, repetitive motions, and improper lifting. Most people don’t realize that by the time they feel muscular pain, surrounding joints and nerves have also become affected. This is why chiropractic care is so effective in treating muscular pain. It is comprehensive care that addresses not only the muscles, but also the joints and their related spinal nerves. After a thorough examination, the chiropractor will determine the exact muscles, joints, and nerves involved. They can also determine underlying causes and potential perpetuating factors. Depending on the specific exam findings, a combination of treatments may be recommended to decrease pain and speed healing. These modalities may include therapeutic exercises, electrical muscle stimulation, ultrasound, and ice or heat therapy. Massage therapy & myofascial release techniques may also be used in conjunction with these other therapies in order to get the best results. In the event that your condition requires medical attention, an appropriate referral would be made promptly. • For treatment of muscle pain in Dade county we provide services to the cities of South Miami, Kendall, Doral, Hialeah, Miramar, Pembroke Pines, Miami Gardens, and Miami Lakes. Our goal at Accident Pain Clinics of South Florida is to provide our patients with an exceptional experience when they walk through our doors. Quality services are the least we can provide to help patients through the stressful times after a car accident. We also provide transportation to each of our offices for any auto accident complications. Call our office for a medical evaluation today at 855-954-2273. Monday | 9:00 a.m. – 7:00 p.m.
Tuesday | 2:00 p.m. – 7:00 p.m.
Wednesday | 9:00 a.m. – 7:00 p.m.
Thursday | 2:00 p.m. – 7:00 p.m.
Friday | 9:00 a.m. – 7:00 p.m.
Saturday | By appointment only. Monday | 10:00 a.m. – 6:00 p.m.
Tuesday | By appointment only. Wednesday | 10:00 a.m. – 6:00 p.m.
Thursday | 10:00 a.m. – 6:00 p.m.
Friday | By appointment only.